Due to the fact of using it, specially when browsing the Internet, installing and uninstalling applications, and downloading files, our PC's performance can be affected and can stop working like at the beginning, which can be fixed using the proper tools. 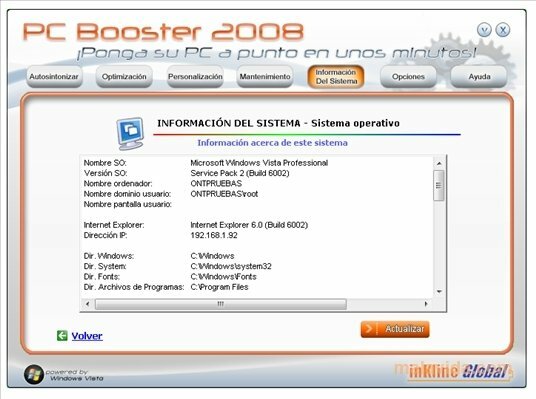 PC Booster is an application developed to perform various maintenance processes that can improve our computer's performance and therefore, is advisable to have installed. - Deletion of obsolete files. - Cleaning the Windows Registry file. - Elimination of the browser's cookies. - Analysis of the system's stability. - Optimization of web browsing. - Prevention of system blocks by means of a better memory management. - Configuration panel that will allow you to configure the system's graphic properties. Give your computer's speed and general performance a boost thanks to PC Booster, a practical and efficient tool that is really easy-to-use.